How was Gutenberg affected by the zeitgeist of his time and place? 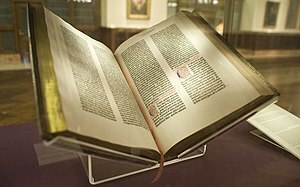 How was Gutenberg affected by his family and other personal life circumstances? How does Zeitgeist of the Late Medieval/Early Renaissance influence design development? o How much is it worth today? Bed: The horizontal carriage of the upright printing press, in which the chase or tray containing the letters is securely placed. Composing Stick: Originally a wooden tray held in the hand and filled letter by letter by the compositor. Forme: a completed section of lines, usually a page, either tied or held by pressure in a frame that is placed in the bed of the press for printing. Hand-Caster: an ingenious hand-held device that clamps the matrix in its base, allowing a typefounder to pour molten metal in an upper hole to cast a letter. Inkball: A stuffed leather ball set in a wooden handle. Used in pairs to spread the ink onto the letters. Said to have been made of poreless dog’s tongues and cured in urine. Matrix: the mold, now usually copper, that is made when the punch is driven into it with a mallet. Other metals or even clay or sand may early have served as matrices or molds. Platen: The flat block or surface that puts pressure on the inked letters, transferring the ink from letters to paper. In wooden presses this hung from the press’s top bar and was dropped by means of a lever. Punch: a tempered steel shaft on which each letter of a given font is carved. Recto: The right side of a leaf, having an odd-numbered page or folio. Type case: a large wooden case divided into scores of compartments, one for each sort of letter to be set into lines.